We are a multicultural, interdenominational and participatory community of people of varying ages, capacities and backgrounds. We come from a variety of Protestant church traditions as well as Catholic and Anglican. Our congregation was formed in 1953 to provide worship services, Christian education, fellowship and service using the English language. From its beginning Jakarta Community Church has been open to “people of any nation, race or creed”. Our legal agency is the English Language Congregation of the GPIB Effatha, which provides facilities for the church’s activities. Authority for the administration and supervision of the activities of the Jakarta Community Church is vested in the Church Board which is elected annually from among members of the congregation. Inclusive, participatory worship each Sunday morning at 10 am in the air conditioned comfort of Effatha Church, Blok M. Holy communion (to which all are invited) is celebrated on the first Sunday of each month. Opportunity is given to all members of the church to contribute to the preparation and leadership of the worship of the church. International and local visiting clergy and lay persons share responsibility for preaching. Informal coffee time following the morning services provides opportunity to share together. A Christian education program for children of school age using an internationally recognized curriculum is held at the same time as Sunday worship. Special occasions in the life of members (such as births, deaths, marriages, baptizing) and special events in the church year are celebrated from time to time. A Bible Study group meets to talk various aspects of life and find guidance from Bible in order to deepen our spirituality. Within the limited budget a long standing active outreach program supports projects which seek to empower people to maximize community potential and encourage positive values. Once a month, following morning worship, we seek to draw on resourceful people to explore contemporary themes and issues of importance and interest. Regular “pot luck” community lunches following the morning service are opportunities for sharing with each other, meeting new friends and deepening community. Our choir and music group plays an important role in leading worship. Jakarta Community Church welcomes people with an interest in music and worship and especially people who can play instruments. Our musicians and singers do not “perform” during services. Their purpose is to help the congregation to worship and especially to “discover” and use unfamiliar worship resources. The music group meets for practice on Sunday mornings at 9am and at other times by arrangement. Church members seek to support each other and respond to requests for prayer and other personal assistance. A minister supports members in their care for each other and is also available to the church and community for pastoral counseling. Qualified child carers take good care of young children on Sunday mornings in a pleasant and hygienic environment. As part of Effatha Church (a congregation of the Gereja Protestan di Indonesia Bagian Barat), Jakarta Community Church seeks to take its place among other churches in Indonesia as well as networking with congregations of expatriate people. Through its members, Jakarta Community Church is also in close touch with several community groups in Jakarta. Jakarta Community Church recognizes that many people are not in a position to make long term or exclusive commitments to our community. It encourages a commitment to belonging on terms with which people feel comfortable. It will welcome your participation on your terms. Jakarta Community Church also welcomes your suggestions on how it can serve you and your needs better. All are invited to join in any or all of these activities. Ask for more information from the church office or from a member of the Church Board, who will be pleased to discuss possibilities with you. The church board is elected annually by the congregation from among its members. Members of the Board may be contacted through the church office. 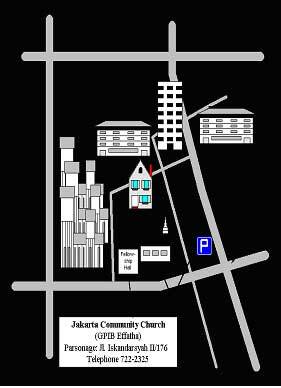 We are located in the very prominent complex of Effatha Church at Blok M, Kebayoran Baru, South Jakarta. The Effatha Church complex is almost completely surrounded by Pasaraya Blok M and faces Jalan Malawai. Our office and activities’ centre is located at the rear of the compound. Sunday worship is held in the Fellowship Hall at the front of the complex. Parking is normally available by entering from Jalan Malawai. Free parking is also available in Pasaraya. The office is normally staffed on Tuesdays – Fridays from 10am – 4pm and Saturday from 10 am – 1 pm. Jakarta Community Church welcomes all who choose to share in our worship and service of God. Whether Jakarta is your permanent home, you are just passing through or something in between; we encourage you to make Jakarta Community Church our spiritual home.